You can't see it all in a short visit, so where do you begin? The British Museum is massive and overwhelming. It tells the story of human civilization from its earliest days right up to the present. With 8 million objects in the collection and tens of thousands on display at any one time, what should you try to see if you've got a day or just a few hours to visit it? What is it? It was the key to unlocking the mysteries of Egyptian hieroglyphics. The Rosetta Stone is a decree passed by Egyptian priests on the first anniversary of the coronation of the Pharoah, Ptolemy V. The decree is written in hieroglyphics - the priestly form of writing by then, in demotic or everyday Egyptian of the period, and in Greek. By comparing the three languages on the tablet, scholars were finally able to translate Egyptian hieroglyphics. 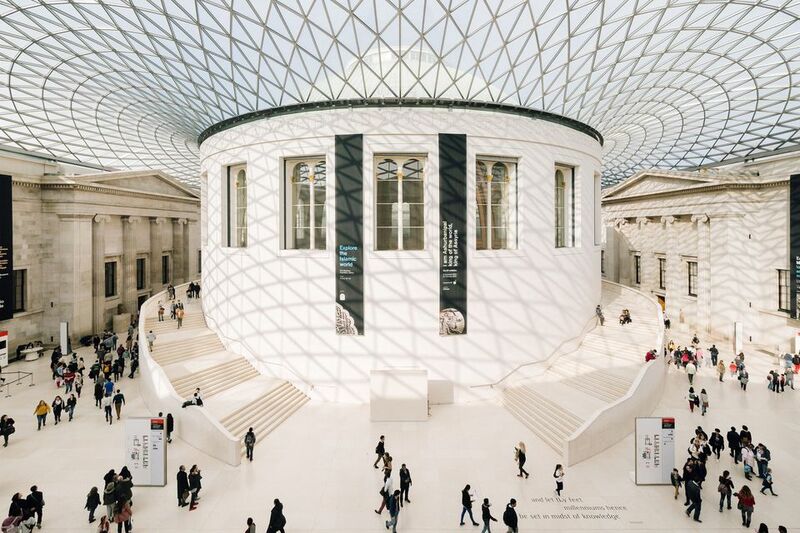 How did it come to the British Museum? The stone was discovered in 1799, during the Napoleonic Wars, by French soldiers digging the foundation of a fortress in El-Rashid (Rosetta). The British acquired it, along with other Egyptian antiquities, under the terms of the Treaty of Alexandria when Napoleon was defeated. It has been displayed at the British Museum since 1802 with time out in a deep tunnel under London during WWII. Where to see it: Find it in ground floor gallery 4. It is one of the museum's selections of "A History of the World in 100 Objects." How did it come to the British Museum? The history of the vase is cloudy and it has passed through many hands. No one knows exactly when and where it was found. It was recorded in the collection of a cardinal in 1601 and then belonged to an Italian noble family for 150 years. In 1778, Sir William Hamilton, British Ambassador to the Court of Naples, bought it and brought it back to England where he sold it to the Dowager Duchess of Portland. It was her son, the 3rd Duke of Portland, who loaned it to Josiah Wedgwood to make his famous copies in 1786. It was loaned to the British Museum in 1810 and finally purchased by the museum in 1945. Where to see it: It's in the Roman Empire exhibit, Room 70 on the Upper Floor. What is it? The British Museum has a very fine collection of mummies, many of which are displayed so that visitors can appreciate their elaborate wrappings and, in some cases, see the clothes and shoes they were buried in. But the cat mummies are an interesting devotional sidelight of the later Egyptian period, perhaps the 1st century. Cats were associated with the goddess Bastet and it's possible that young cats were periodically culled from her temples and mummified in elaborate wrappings so that the faithful could purchase them and bury them in special cat cemeteries. How did it come to the British Museum? Cat mummies were so common that many cat cemeteries were destroyed before archaeologists could study them. In the 19th century, a shipment of 180,000 of them was sent to Britain to be processed into fertilizer! The British Museum has several examples. The one pictured here was a gift from the Egypt Exploration Fund. Where to see it: Look for the Cat Mummy as well as a falcon mummy and a big collection of human mummies in the Egyptian Room, Gallery 62-63 on the Upper Floor. What is it? A gigantic head (about 9 1/2 feet tall, weighing 4 tons) of Amenhotep III, a pharaoh who ruled between 1390 and 1325 BC, originally part of the temple of Mut, in Karnak, Egypt. The features were later recarved for Ramses II (1279-1213 BC) to represent his own ideals. That included thinning the lips. The head is wearing the double crown of Upper and Lower Egypt. How did it come to the British Museum? The head was discovered sometime before 1817 and purchased by the museum in 1823 from British archaeologist Henry Salt who found it in a warehouse in Cairo. Where to see it: See it in Room 4 on the Ground Floor. What is it? The most iconic object from the Sutton Hoo site, an incredibly rich and undisturbed ship burial of a wealthy Anglo Saxon individual - probably a king - dating from early 7th century East Anglia. Objects from the burial include a hoard of coins and intricately worked objects of gold, jewels, and leather. How did it come to the British Museum? The Sutton Hoo Burial was discovered by archaeologist Basil Brown in 1939 when excavating the largest of 18 mounds on a Suffolk estate. When found, the helmet had been crushed by the collapse of the mound and was in 500 pieces. First restored in 1947, it was taken apart and reassembled in 1968 based on later available research. That was when the remarkable face mask first began to reveal itself. Where to see it: The assembled mask and a reconstruction of what it would have looked like when new, along with many other treasures from the burial are located in the World of Sutton Hoo exhibit in Room 2 on the Ground Floor. What is it? A large group of chess pieces, carved in walrus ivory and whalebone sometime during the 12th century. The pieces have been variously attributed to Icelandic, English, Scottish and Norse craftsmen. Current thinking is that they were made in Norway and were hidden by a merchant en route to trade them in Ireland. Fans of the Harry Potter films should find them familiar as they made an appearance in "Harry Potter and the Philosopher's Stone." They are the largest collection of objects for leisure use from the period ever found. How did it come to the British Museum? The chessmen were found buried near Uig on the Isle of Lewis in the Outer Hebrides in 1831. The newly discovered set was first shown at the Scottish Antiquaries Society, who were unable to raise funds to buy them. The British Museum then acquired them for the nation. At the moment, 82 of the 93 existing pieces are in the British Museum and 11 are in the National Museum of Scotland, in Edinburgh. The chessmen are very popular and pieces often tour the UK, Europe, and Asia. Where to see it: See the chess set in Room 40, the Medieval Room, on the Upper Floor. How did it come to the British Museum? The statue was acquired from a ceremonial center in Orongo, Rapa Nui, by Commodore Richard Ashmore Powell, Captain of the HMS Topaz during an expedition in 1869. The Lords of the Admiralty presented it to Queen Victoria who then gave it to the British Museum. Where to see it: The statue is part of the Living and Dying exhibition in Room 24 on the Ground Floor. What is it? The Elgin Marbles are a series of friezes and sculptures that were originally part of the Parthenon on the Acropolis in Greece. They are somewhat controversial as, from time to time, the Greek government campaigns for their return - particularly since the creation of the New Acropolis Museum which was built to house them. The British Museum maintains that they are safer in London where they are more widely available to millions of visitors. This is an ongoing argument but, meanwhile, the British Museum is the place to see them. How did it come to the British Museum? The marbles were acquired between 1801 and 1805 by Lord Elgin (Thomas Bruce, 7th Earl of Elgin), Ambassador to Constantinople (Istanbul), the capital of the Ottoman Empire. Greece had been part of that empire from the mid 15th century. Elgin believed by removing the marbles he was protecting them. At one time, the Ottoman Turks had used the Parthenon as a gunpowder store. Elgin planned to give the marbles to the British nation but financial troubles on his return to England forced him to put them up for sale. They were acquired by Parliament and passed on to the British Museum. Where to see it: The suite of marbles and objects from the Parthenon has a whole gallery devoted to it. See the marbles, which are called the Parthenon Marbles, in Room 18 on the Ground Floor. What is it? A double-headed snake made of wood, covered with turquoise mosaics and decorated with oyster and conch shell. It is an example of Mexica (Aztec) art and measures about 17 inches wide by 8 inches high by two inches thick. It was probably worn as a pectoral or breastplate for ceremonial purposes. It dates from the 15th or 16th century. How did it come to the British Museum? It was acquired by the museum from a collector in 1894. What is it? Vindolanda is a Roman fort and settlement near Hadrian's Wall on the northern edge of the Roman Empire in Britain. The tablets, discovered during excavations, are letters home written by ordinary Roman soldiers as well as letters between officers, wives, and families stationed in Britain. Written on thin sheets of wood in a carbon-based ink, they about ordinary life: a set of accounts from a merchant showing brewery bills paid, a civilian's appeal to a provincial governor protesting an unjust beating, a letter from one slave to another talking about preparations for the December festival of Saturnalia. The British public recently voted the Vindolanda Tablets the greatest treasure of the British Museum. They are the earliest examples of handwriting in Britain. Look especially for the birthday party invitation from Claudia Severa to Sulpicia Lepidina, pictured here. The handwriting of Claudia Severa is one of the earliest known examples of writing in Latin by a woman. How did it come to the British Museum? The tablets were preserved because they were water-logged and protected from air. They were discovered during the ongoing Vindolanda excavations near Chesterholme, England, and purchased by the British Museum in 1986 from the Vindolanda Trust. Hundreds more have since been found in a soggy rubbish dump at the site.